Yurchikhin was the lead spacewalker and wore the new Orlan-MKS spacesuit; it had blue stripes. Ryazanskiy wore the older Orlan-MK suit, which also had blue stripes. They were designated as EV-1 and EV-2, respectively. Once outside Pirs, the first order of business was to collect a materials science sample pallet just outside the hatch. 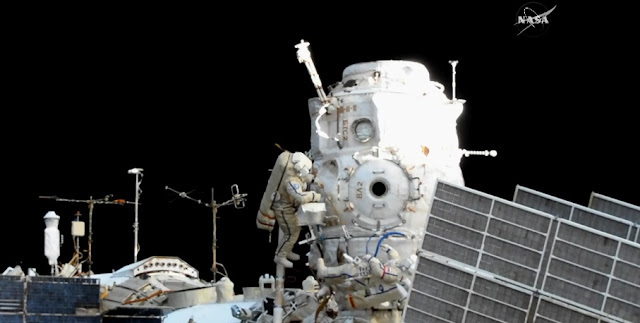 According to Spaceflight101, the “Restavratsiya” (Restoration) experiment was placed outside during the previous Russian spacewalk, which occurred in February 2016. It involved applying thermal protection foil to a plate to see how it fared over time. The collected samples will be returned to Earth. After that was completed, the two Russians set up to deploy several small satellites. Five spacecraft in total were manually deployed, meaning they were each tossed away from the outpost by one of the cosmonauts. In this case, Ryazanskiy threw the satellites while Yurchikhin passed them over to Ryazanskiy. Of the five satellites, the first one that was deployed – Tomsk-TPU-120 – had a 3-D-printed structure. The goal of the 5-kilogram satellite was to test new satellite materials. Another satellite is testing new small satellite systems such as those for power generation, communications, and attitude control. Two satellites were testing satellite networking systems and a fifth is being used to calibrate ground tracking equipment, according to SpaceFlight101. After the satellites were deployed, the cosmonaut duo went on to take photos of an experiment panel and the OHA antenna boom. The longest portion of the spacewalk was the installation of handrails and struts for future spacewalkers. These will allow for easier movement around the exterior of the Russian segment of the ISS. A strut and two handrails didn’t easily fit into their locations and required extra time. The last handrail installation was called off because the duo was behind schedule. Throughout the EVA, the crew performed various other tasks ranging from taking pictures to collecting samples from external experiments. Some new experiments were installed too. One, in particular, was the “Impakt” study. It exposes materials and coating samples to space to see how they fare over time. Additionally, researchers are looking to see the nature of corrosion caused by thruster exhaust and propellant residue left behind from engine firings on Zvezda and visiting vehicles. After performing tasks around thrusters, the crew was instructed to wipe their gloves and suits with towels to remove any toxic thruster residue. The towels were thrown away from the station to burn up in the Earth’s atmosphere later. The Plume Impingement and Deposit Monitoring Experiment, a study similar to Impakt, was moved to a different area for more data points. The study looks to collect data on the characteristics of thruster plumes from visiting vehicles. In particular, researchers want to understand the processes that cause accumulation of combustion products on the external skin of the ISS. During the whole EVA, the Orlan-MKS suit was being evaluated. It is designed to be easier to use and be more robust. It can be used 20 times over six or seven years supporting spacewalks up to nine hours in duration. Additionally, it has a new thermal control system, suit management computer, and a more durable material in the outer protective layers of the suit, among other things. The latter also makes the suit lighter. The hatch was closed at 6:10 p.m. EDT (22:10 GMT), officially ending the spacewalk. Yurchikhin, who was on his ninth spacewalk, now has a total career EVA time of 59 hours, 28 minutes – fourth all-time high behind Peggy Whitson who has 60 hours, 21 minutes over 10 excursions. Ryazanskiy was on his fourth spacewalk. His first was in November 2013. During that high-profile EVA, he took the Olympic torch outside in advance of the 2014 Sochi Winter Olympics. His total career time now stands at 27 hours, 39 minutes. Since 1998, 202 spacewalks have been performed in support of ISS assembly and maintenance, including this one, for a grand total of 1,258 hours, 15 minutes, or 51 days, 10 hours, and 15 minutes.